The cost of landscaping depends on how you envision your new garden space. Landscaping is the umbrella term used to describe the process of making your garden more aesthetically appealing. Adding plants, adding a patio, adding a trellis: these are all components of landscaping. Thus, we can immediately assert that the cost of landscaping is dependent on the elements you intend to introduce. Do you want a garden that is covered in concrete adorned with a few potted plants? Are you a keen gardener who would like lots of flowerbeds and a rustic feel? The cost of a landscaping project could range from a few hundred dollars to over $40,000 for a sophisticated design. People usually spend around $1,500 to $5,000 for new landscaping projects, but that largely depends on what the project is. Hardscaping refers to all of the ‘hard’ elements you wish to introduce into your garden project: gazebos, decorative rocks, fountains, and pathways. These elements are going to be more expensive than what’s known as softscaping. Softscaping is anything that is living or natural: from plants to trees to bushes. Thus, the proportion of hard to soft that makes up your vision for your yard will impact the overall cost. As a general rule, the more hardscaping you have, the more expensive it will be. However, you might want to consider the fact that softscaping elements will require more care and maintenance than hardscaping ones, so longterm costs can tip the scales a bit. Installing a patio is a popular landscaping project as it creates an outdoor living space capable of fulfilling a number of purposes. You might have a dog that you want to keep in a concrete space so that it is easier to keep their area clean. Alternatively, you might be a person or family who enjoys entertaining with barbecues. Patios provide an excellent space for all sorts of outdoor entertaining. A typical 12′ x 12′ patio often costs $1,700 to $2,800 to install. The cost of a patio starts with measuring the space to find the square footage, then selecting a material, and finally multiplying the square footage by the cost per square foot for the chosen material. Our paver calculator can estimate materials and determine the costs for paver patio projects. Many landscaping projects involve buying soil, mulch or rock. These include adding flowerbeds, ordering fill dirt for a site that needs leveling, buying mulch for gardening requirements, or buying large or crushed stones for either aesthetic or practical purposes. These materials are commonly measured by the cubic yard. To find the cubic yardage and estimate the cost, you need to know three types of measurements for the material in question: the length, the width, and the height. These three measurements are necessary components of calculating the cubic yard required for your landscaping project. The cost of your landscaping project depends on how much work needs to be done. You might be a homeowner who has been living in the same house for years who wants a bit of life brought back to your garden. This kind of project, which could include the introduction of a flower bed or restoring patchy areas of grass, will cost a lot less than someone who has moved into a new property that pretty much has a square of mud calling itself a yard. Alternatively, you may have just bought a new home that already has a landscaped garden that needs a personal touch or two. All of these examples create very different scenarios in terms of what the overall landscaping cost will be. Seeding the average sized yard usually costs about $100 to $300 for seed and materials. Hiring out the project and additional prep adds to the price. Adding sod to your garden, assuming that you use either nursery sod, Bermuda, or Blue Rye mix, costs 80 cents per square foot including labor. This does not include the preparation of the soil, however. Placing 4-inch deep topsoil on a level site costs approximately $19 per cubic yard, while it costs a bit more for an area that is sloped. This does not include the equipment for the task but is priced in terms of equipment being used. If done by hand, the costs go up again: about $38 per cubic yard on a level site and $44 per cubic yard on a sloped site. Use our soil calculator to estimate how much soil you’ll need. Assuming that you want to improve the look of your soil or add something to it for other reasons, the cost varies depending on the material. Assuming it is being spread by hand, natural wood chip mulch costs roughly $60 per cubic yard, forest mulch $84 per cubic yard, peat loam $90 per cubic yard, and organic compost is nearly $90 per cubic yard. Calculate the amount of mulch to buy using our mulch calculator. If you want to add interest to your garden space by adding some stepping stones, it is useful to find out the cost of some different sizes of stepping stones. The price of these is per stone and includes labor. 12 inch round stepping stones cost about $7 each, 14-inch round $8 each, 18-inch round $12 each, and 24-inch round are around $17 each. Above are estimates for just some landscaping elements you may want to introduce into your garden. These are a great starting point for homeowners who are undertaking a project and need help doing a budget. See our landscaping and patio resources and calculators before starting your next outdoor project. Find how much crushed stone is needed for a gravel driveway in cubic yards and tons, and estimate the cost of materials. Are You Planning a Landscaping & Lawn Care Project? Get hassle-free estimates from local landscaping & lawn care professionals and find out how much your project will cost. How Much Does It Cost to Build a Retaining Wall in 2019? 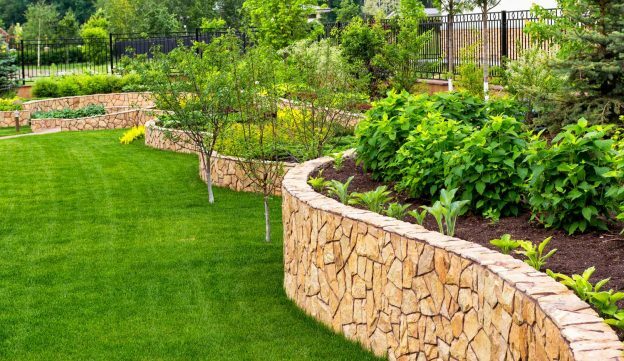 Find out how much it costs to build a retaining wall. Cost is usually determined by the size of the wall, the selected materials, and the amount of labor needed. How Much Does it Cost to Build a Patio in 2019? Find the average cost to install a concrete, paver, flagstone, gravel, or brick patio. Calculate how many retaining wall blocks are needed to build a wall. Estimate the retaining wall cost given the price of the preferred block.